With the New Year approaching, it’s time to look at the UPS and FedEx rate increases for 2018 and how they will affect your costs. In September, FedEx announced an average increase of 4.9% on Express and Ground services. UPS joined the party in October, announcing that they will also be increasing their rates by an average of 4.9%. The new 2018 UPS rates will take effect on December 24, 2017, while FedEx will be instating them a week later on January 1, 2018. The averages might be the same, but the rates vary. With higher increases for some services and lower increases for others, you can’t budget based on your costs increasing 4.9%. It’s important to look at what services you use, your package characteristics, and the locations you’re shipping to, and then evaluate the new rate charts to find your biggest cost offenders from the 2018 FedEx and UPS rate increases. 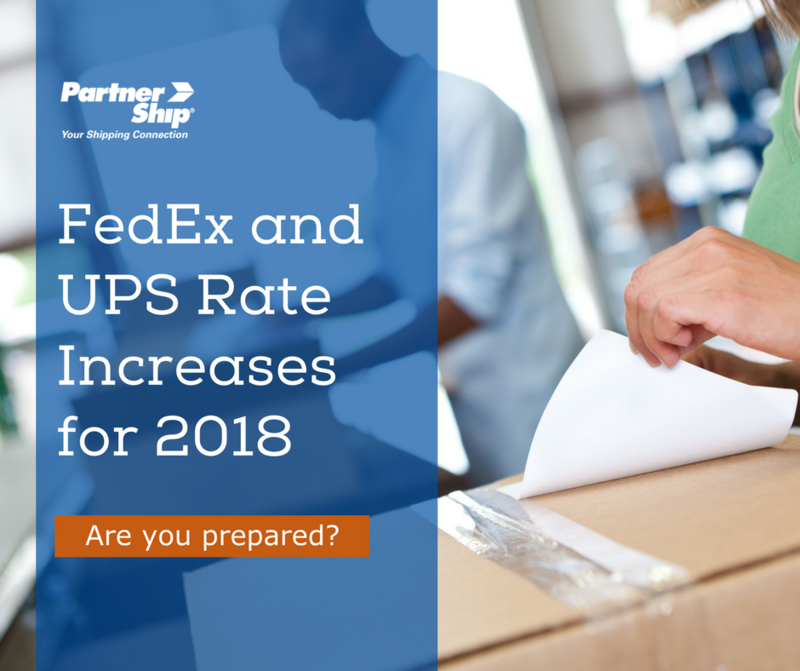 On top of the FedEx and UPS rate increases for 2018, there are additional updates that are likely to affect your shipping costs. First, UPS is lowering its dimensional (DIM) weight divisor from 166 to 139 for domestic packages less than or equal to one cubic foot (1,728 inches) in size. With this change, UPS and FedEx are back in line with each other on how they calculate dimensional weight. Both carriers will now use 139 for all domestic and international packages. It’s been a wild ride the past few years with multiple changes to which packages DIM weight pricing applies to and how it’s calculated, so this is a welcome stabilization. However, a lower divisor means a higher chance that your package will get billed at your DIM weight, rather than your actual weight. If you ship packages one cubic foot or under with UPS, it’s important to take note and make changes to eliminate any unused space in your packaging or consolidate orders when possible. Surcharges are also increasing, with some at alarming rates. Most notably, in 2018 FedEx and UPS are coming after larger, oversized packages. Not only are they increasing at a higher rate than most surcharges, they are by far the most costly. For example, the FedEx Unauthorized Packages fee is increasing from $115 to $300 and the UPS Over Maximum Limits charge is increasing from $150 to $500. The shipping trends that have resulted from the rise of e-commerce has taken its toll on the carriers and they’re having to move more and more oversized packages that can’t go through their automated systems. Time is money, so they’re tacking on hefty fees to make up for it. Ahead of the new FedEx and UPS rate increases for 2018, new holiday peak season charges will also apply. UPS is adding peak surcharges on domestic residential packages during the busiest shipping days of the year – from November 19 to December 2 and from December 17 to December 23. These fees will add up quick when you have an increased amount of orders over the holidays. In a notable departure from UPS, FedEx decided not to add a peak season surcharge this season. Instead they opted to increase surcharges for packages that are big or bulky enough to require special handling. UPS is also increasing the cost of larger packages by adding additional peak season surcharges on top of the already existing surcharges. The 2018 UPS rate announcement included increases for these surcharges for the next holiday season, so you can expect this trend to continue. The 2018 FedEx and UPS rate increases are proof that the carriers are getting smarter, hitting shippers where it hurts most. Luckily, you don’t have to navigate the changes alone. The shipping experts at PartnerShip have evaluated the new rate charts and we have completed a detailed analysis, so it’s easier for you to assess the impact on your shipping costs. Download our free white paper today!